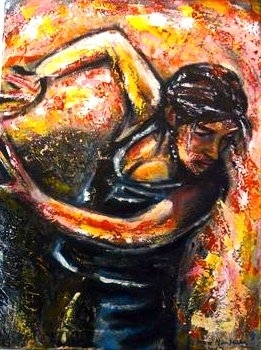 This is one of my last Flamenco paintings, done with a palette knife. thanks ever so much!!! so nice to have feedback from you!! thanks!!!! and nice new profile picture!! You're very welcome and thansk Alicia! birds are beautiful subjects for art! watercolour would be great for your picture! do you also draw/paint animals¿? you did that picture??? it is amaaaaaaaaaaazing!!!! well done! good work deserves such a compliment! thanks Adriana, you are great!!!!!! fabulous, simply fabulous!!!! Great "knife" work! yes! España y olé! (Spain and olé). No idea how to translate olé! but i m sure you get the idea! it is just as spanish as the paella! wow! and what does it mean? i m curious! now i see what you mean! and i realise i use it a lot already! a funny little story, i was taking german tourist to a native village closeby, there was another tourist group from france, i had to translate into german and the french group had their translator... the guide explained something and after the french tourguide explained it to his group one french lady suddenly said: EISH! a moment of silence and suddenly EVERYBODY laughed loud! it was so funny! superb story! you really made me laugh, i needed it, thanks!!! oh my God! take care!! drink lots of water! how far is the sea from your house? here we have sunshine today,very nice photos with the snow! oh yes, i am one of the worlds biggest water drinkers, i LOVE drinking water... it takes 5 hrs drive if there is no heavy traffic on the main route to the coast... 5 hrs too long for my liking! wow 5 h! that reminds me when we lived in the UK, we had to drive 6-7 h to go to Cornwall, the nicest (and closest) beaches around...and we were often just going for the weekend! oh i can imagine, i am also like you, if i have a nice car with a soundsystem and airconditioner it is better, but i drive a small little VW Golf, that is old and no radio, no aircon i get tired very easily driving in that little car... BUT i think it is more, i am getting old..
i understand!! Fabien does all the driving now, i just don´t like it anymore! so happy you like it, master! Wow, great movement; beautiful, vivacious colors!! thanks so much, i m so happy you like it! i love bright and vibrant colours! EL FLAMENCO IS BACK!!!! GREAT JOB ALICIA MY FRIEND!!!!! !